The architect of this plan was arrested on the orders of the King. 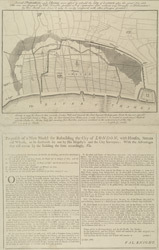 Presenting this plan as a rebuilding scheme after the great fire of 1666, Valentine Knight, an army officer, proposed the idea of a canal 30 yards wide, circling the City from Fleet to Billingsgate. He informed the King that the Crown could be provided with large revenues if taxes were imposed on good unloaded at various docksides along the course of the canal. His considerations affronted the King as they presumed that he would wish to benefit from such a public calamity. The plan is accompanied by a textual explanation, written by Knight, explaining his proposals.